As I shared previously I set out a goal to do something for 30 days. I was inspired by Matt Cutts and his TEDtalk. I admit I have been in a rutt, knitting small stuff that takes no real commitment other than to sit down and knit straight for 2 hours and voila a hat is finished. So after lurking through TED one night I got inspired. And when you get Inspired about something, magic happens, you then begin to DO something and then after that the Motivation kicks in! So here I am, maybe a week into it and what you see is the bottom. 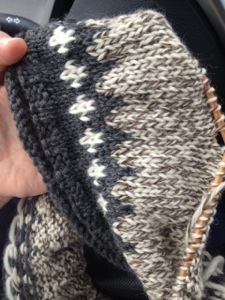 Knowing that when you knit stockinette the edge rolls up, I changed color to create a surprise, added a couple rolls of ribbing then onto the intarsia. I’m definitely excited the way it’s turning out. The body of the sweater seems mammoth to me, I hope it goes by fast as my attention span wanes on monotonous types of knitting. Enough about that, I’m sneaking some stitches in before I get ready for work. Cheers to Just Doing It! Hip hip hooray! This entry was posted in Knitting, My Home and tagged Icelandic, Knitting, Matt Cutts, TEDtalk on February 19, 2013 by amybailey aka knitsakes.